NDA 2019 : National Defence Academy (NDA) Exam is a national-level entrance exam conducted by UPSC (Union Public Service Commission) to recruit candidates in the Army, Navy and Air Force. This exam is held twice in a year i.e. NDA I and NDA II. NDA I Exam will be conducted in the month of January while NDA II will be held in the month of August. Latest Update: NDA 1 2019 Admit Card will be released in the last week of March 2019. Latest Update: Today (04/feb/2019) is the last date for NDA 1 2019 Application Form, Fill the form before 06:00 PM. 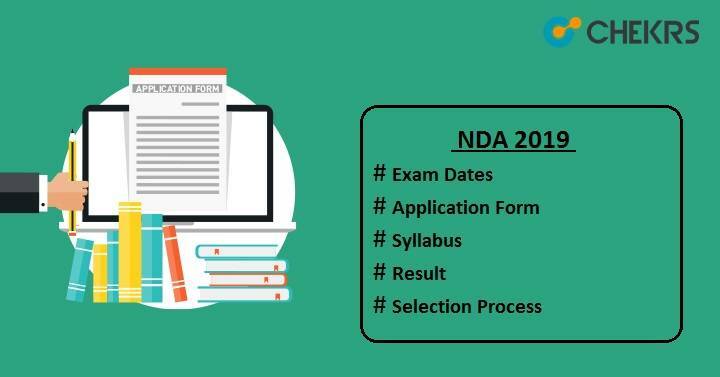 Latest Update: NDA 1 2019 Notification and Application Form Released, Check your Eligibility, Fill the form and get ready for it. Latest Update:NDA 2019 Schedule Announced. The examination will be conducted on 21st April (NDA 1) and 17th November 2019 (NDA 2). Candidates, who will appear in NDA, will have to first qualify in the written test and then have to clear the SSB interview round to get admission in the NDA that is located at Khadakwasla near Pune, Maharashtra. Read this article carefully and get all details related to the NDA exam. Candidates who will take the NDA 2019 exam, check the NDA Exam Dates here. Both NDA I and NDA II will be held on different dates. Students, who are thinking to apply for NDA exam, must check the eligibility criteria first. NDA Eligibility Criteria will be available on its official portal released by UPSC. Candidates without satisfying the criteria will be not allowed to appear in the exam or for further admission process. Here we have listed the NDA Admission Criteria, check it. Aspirants should be an Indian citizen. Candidates must be born between 2nd July 2000 to 1st July 2003 to be eligible for NDA I. For NDA II, those who have born between 2nd January 2001 to 1st July 2004 can apply. Students, who belong to Nepal or Bhutan, but living in India, can also apply. Applicant’s minimum qualification should be 10+2. Candidates should be physically & mentally fit as per the physical standards issued by the officials of NDA. The official authority will release the online application from on its official site. All eligible candidates can fill the NDA I and NDA II Application Form and able to take part in the entrance exam of NDA. The form filling process will be done in 2 parts i.e. first part fill the NDA Registration Form with candidate’s personal details and in the second part, they will have to select the exam, upload scanned images and then pay the examination fee. NDA Application Fee will be Rs. 100/- for all candidates. Reserved categories candidates (SC/ST), Sons/ Daughters of JCOs, NCOs & Ors can fill the form without paying the fee. Applicants can make payment through online mode via credit card/ debit card/ SBI net banking or through challan of SBI bank. To become familiar with the NDA exam, it is mandatory to know the NDA Exam Pattern. It will help you know the no of questions asked from each sections, marking scheme, mode of paper, time duration etc. Check the following exam pattern of NDA to make a better effort in the examination. Candidates should check NDA Syllabus Pdf before start the exam preparation. It will help them to achieve the qualified marks in the NDA exam. The syllabus will be prescribed by UPSC official authority. Check the topics asked in NDA exam in the table given below for better preparation. Candidates who are going to appear in the NDA exam should now start their preparations. Follow the NDA Preparation Tips given below to crack NDA 2019. Make a proper study plan and strictly follow it. Go through the short tricks first, make notes on formula & important topics and memorize on a daily basis. Take help of good books and experts also. Give mock test on regular basis after completing the syllabus. Stay fit and healthy. Think positive and study for at least 8 hours regularly. Prepare With NDA Previous Year Papers. After completing the registration process, candidates can download NDA Admit Card 1 or 2 week before the exam date. It will be available to all students who will register themselves successfully through online process. To download the NDA Hall Ticket, candidates will have to login to their account with the login credentials. Don’t forget to bring the admit card while appearing for the exam. Without it, no one will be permitted to enter in the exam hall. After conducting the exam successfully, NDA Answer Key will be released within a week. The exam conducting authority will not publish any answer key. It will be uploaded by various institutes on the respective sites. With the help of answer key, candidates can estimate their score. Click on the result link given on the home page. Search for your roll number. The cut-off will be released after announcing the results through the online mode. NDA Cut Off will be the minimum marks required to qualify both rounds (Written test and SSB interview). It is necessary to score the maximum marks to be eligible to take part in the interview rounds. Candidates who will clear the exam will be qualified for SSB interview round organized by the Services Selection Board (SSB) of the Ministry of Defence for admission to Army, Navy and Air Force Wings of the National Defence Academy. NDA Selection Process will be done on the basis of student’s performance in the written test and SSB interview & medical fitness. After concluding the SSB Interviews, the final result will be announced and then within fifteen days from the date of releasing of final results, candidate’s NDA Mark-sheet will be uploaded on the UPSC official website. Hello Ashish!! 10+2 as minimum qualification required for NDA exams, So probably not this time!! Also, make sure to check all the Eligibility criteria as per the notification or written above. We will update this if there will be any changes this year so keep visiting and don’t forget to subscribe. Hello Sooraj! As per Notification, DOB should be in between 2nd July 2000 to 1st July 2003 to be eligible for NDA 2019 1. So Sorry about it. But Still, make sure to read eligibility written in Official Notification. By the way, there are tons of good entrance exams, You can check them. Thank You and Keep Visiting. is there no way, that someone who is born in the year 1999, can give the NDA exam? is there a way? please let me know. thank you so much. and i did read that only the mentioned limit can apply for the same, in like the official site so can you please tell me, how else can a 20 year old join the army? are there any other means through which i can serve the country and be on ground? Hello sir , do questions come from NCERT text books for NDA exams ? Partially Yes, But any reputed book which will have topics listed in the official syllabus, can be used for preparation. Check the Syllabus Article here: NDA Syllabus Hope it will help you. Keep Visiting. Hello Tanmay, Age Wise You are eligible but once check Qualification/ Education Criteria. You can get complete information in the notification, check the notification link given above and read it carefully, and then decide. Thank You and Keep Visiting. State Education Board or a University. Mathematics conducted by a State Education Board or a University. You are Eligible for the first one but for not for 2nd. Also, Check the Other Criteria and notification. Thank You and Keep Visting. Hello Anurag, Notification has been just released and According to it “Only unmarried male candidates born not earlier than 02nd July, 2000 and not later than 1st July, 2003 are eligible. “. There is just 26 day’s difference. By the way, Check other Exams, and Keep Visiting. Thank You. Hello J.S.V., Notification Released, Check the link given above. Thank You and Keep Visiting. Hello J.S.V.! Sorry buddy but candidates born Only between 02nd July 2000 and 1st July 2003 are eligible for NDA 1. But still, before deciding anything, take a look at the NDA notification. Thank You and keep visiting.